You need a FitBit. Or at least that’s what your Pinterest friends say anyway. Marla Ahlgrimm agrees and says these stylish wristbands are actually more than a passing trend. 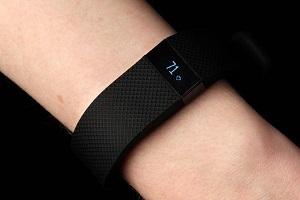 Here, Ahlgrimm talks trackers and offers alternatives to everybody’s favorite (FitBit) Flex. Q: What is an activity tracker? Marla Ahlgrimm: An activity tracker is a wearable device that counts your movement during the day. Some even help you monitor your sleep patterns. Q: What is the best tracker for the beginner? Marla Ahlgrimm: In my opinion it’s the FitBit…the FitBit Flex, specifically. At a cost of around $99, it’s an affordable and smart scale compatible device. For about $30 more, you can choose the Wi-Fi enabled FitBit Aria that allows for BMI and lean mass recording. The Surge model is a big upgrade for $250 but offers on board music control, heart monitoring and GPS tracking. Q: How does the JawBone Up work differently than FitBit products? Marla Ahlgrimm: Jawbone Up was designed for those with troubled sleeping patterns in mind. It actually monitors your sleep and sets off a silent alarm when you would best benefit from waking. The biggest caveat here is that you need to have a somewhat flexible schedule since your rise time might vary from day to day. Q: Is the Basis Peak worth the $200 price tag? Marla Ahlgrimm: It really depends on what your needs are. The Peak is the only tracker suitable for water submergence; the others are only water resistant and can be worn in the shower but not for swimming. For $200, you are getting quite a bit of functionality including automatic tracking of certain activity such as biking and running. This saves time logging hours for each. As well, the Peak automatically logs sleep, so you don’t have to worry about remembering to do that right before bed. Overall, it’s a pretty good buy for truly dedicated athletes but the FitBit – or even a cheaper clip-on pedometer – offers benefits for those of us less athletically inclined.